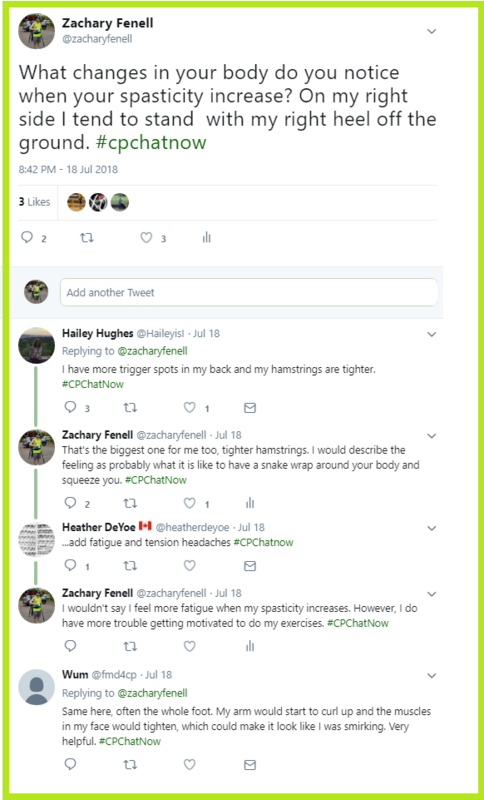 Spasticity held a tight grip on the conversation Wednesday, July 18th, 2018 during the live cerebral palsy Twitter chat #CPChatNow. I am co-host Zachary Fenell, filling in for my co-host Devin Axtman who missed the July 18th chat. 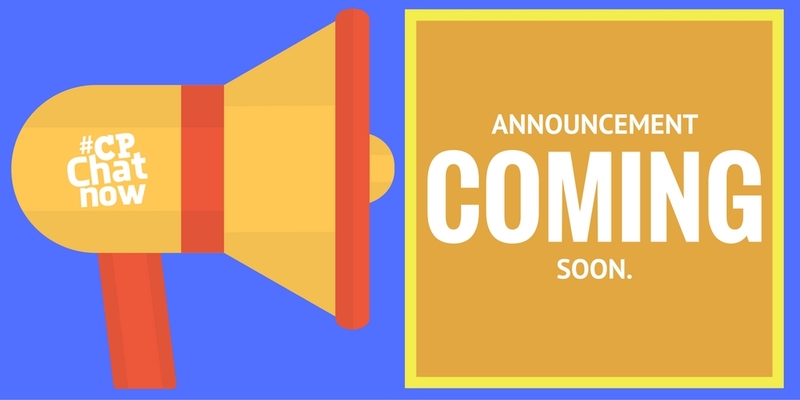 Before delving into the night’s discussion, I made a couple housekeeping announcements. 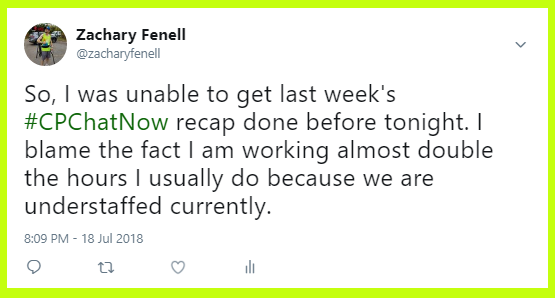 Due to increased hours at work I proved unable to finish the previous week’s recap prior to the 18th. 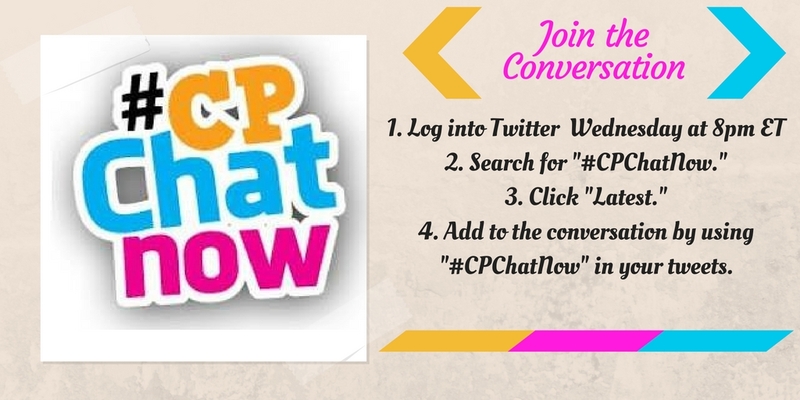 That recap now remains ready to read, “#CPChatNow Recap- 07-11-2018.” Our other announcement related to our monthly Google Hangouts. 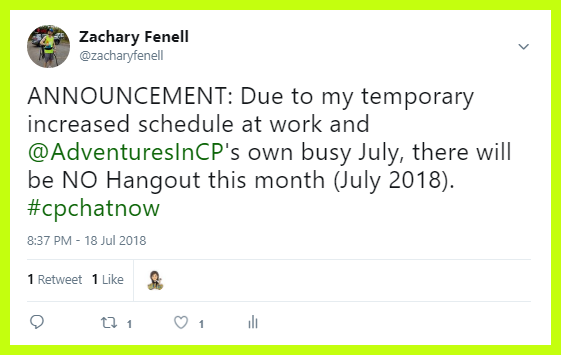 Unfortunately due to my and Devin’s schedules this month, NO July 2018 Hangout will take place. You could say our schedules remain tight. Literal tightness surfaced as a subject a short while later. 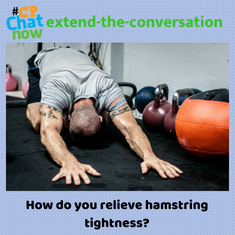 Recently encountering increased tightness, I asked the group what changes to their bodies they notice when their spasticity increases. 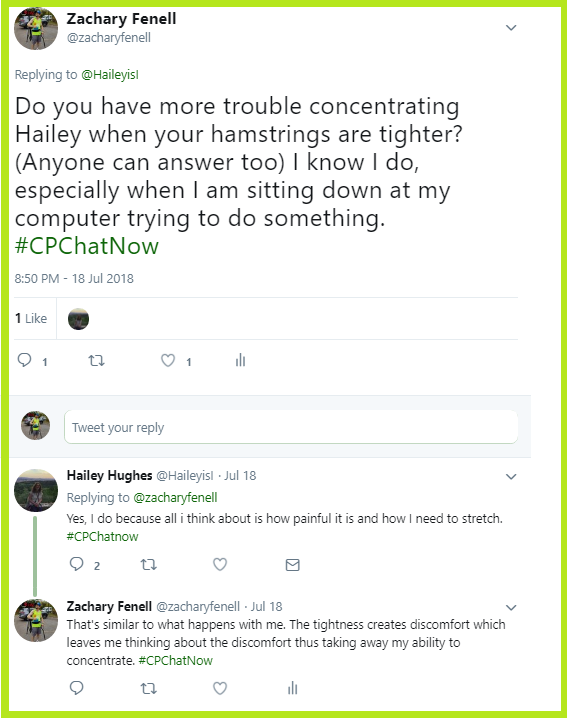 Hailey Hughes mentioned experiencing more trigger spots in her back and tighter hamstrings. Heather DeYoe added fatigue and tension headaches to the list. Wum said her arm starts to curl. Plus her facial muscles tighten, causing her to smirk. These physical reactions can cause additional challenges. Hailey and I both find tighter hamstrings leads to difficulty concentrating. Pain and discomfort distract our minds. Stretching helps to remedy the situation. However, another participant pointed out stretching does possess flaws. 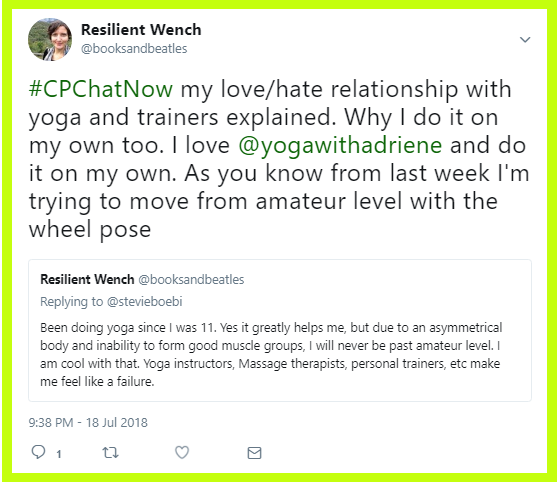 Chat regular, the self-proclaimed “Resilient Wench,” Rachel noted stretching may shock the body and leave movements feeling strange. She instead prefers yoga triangle poses. 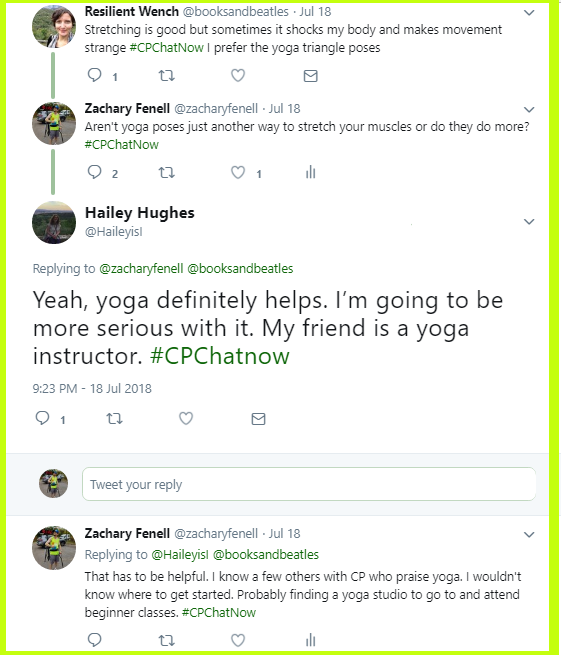 Hailey also vouched for yoga. I recalled hearing others with CP previously praising yoga too. I admitted though, I would not know where to begin. Thankfully Rachel offered her insights. Rachel shared her history with yoga, which dates back to her childhood. She explained due to her asymmetrical body and inability to form good muscle groups she will never surpass an amateur level. Therefore she does yoga on her own, guided by Adriene Mischler’s (Yoga with Adriene) Youtube videos. Yoga? Stretching? Something else? Leave your response by commenting below.